New studies are constantly backing up the health benefits of wine (for moderate drinkers). But like most things, the quantity, quality, and timing (when you consume it) all matters. Longer life. Studies show that resveratrol, and antioxidant in wine, can help improve longevity. Better immunity. Moderate wine consumption can ward off infections and boost the immune system. Improve bone density. Red wine has high levels of silicon, which increases your bone mineral density and reduces the chance of osteoporosis, plus helps get you drowsy at night. Reduce risk of stroke and heart disease. Moderate consumption of wine acts as a natural blood thinner which can prevent blood clotting. Plus, the tannins found in red wine contain “procyanidins” which neutralize free radicals and can help prevent cardiovascular disease. But again, more than the moderate consumption (1-2 glasses) can actually increase your risk of heart problems, so beware! Lower insulin sensitivity and risk of type 2 diabetes. There is research showing that wine – primarily due to the resveratrol - can improve insulin sensitivity, which can mean lower chances of heart problems and diabetes. Reduce risk of cancer. The risk of colon cancer, prostate cancer, and breast cancer can be reduced by drinking a glass of wine, particularly red wine whose resveratrol fights against cancerous cells. Wine, just like any substance with alcohol, must be consumed in SMALL amounts. A proper glass of wine is just 5-ounces (usually fills about ½ to ¾ of your wine glass). And “moderate drinking”, or what is “clinically” considered to be healthy, is only one glass for women and two glasses for men. Wine is meant to be consumed with a meal as the food will help absorb some of the alcohol, and therefore help mitigate the negative impact on your blood sugar and hormones. Ideally, you want to have your wine right after your meal, so your body prioritizes metabolizing the healthy food first, and THEN the alcohol. I always say, when you choose your guilty pleasures, choose them well. Go for what you like most, and have it in SMALL amounts. Red or white won’t make a significant difference if you keep it to 1-2 glasses. But generally, you want the wine to be DRY (because the sweeter it is, obviously the higher sugar content). 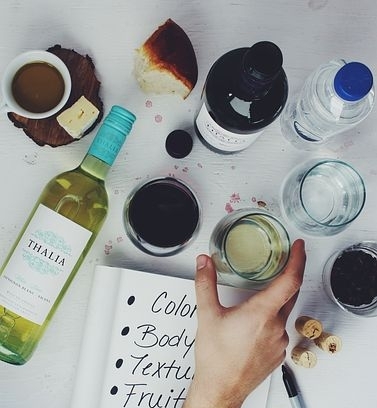 And look for a good quality wine (a cheap wine may not be fully fermented and may even have added sugar) that is pleasant to your palate, and ideally, look for organic wines, where the grapes are grown without the heavy pesticides that can irritate your gut. So now, go enjoy a glass of a delicious wine, and remember, benefits come when consuming in small amounts. So sip it slowly and savor that glass.